Imaginario Popular Argentino is a series for solo guitar, that consists of two parts: Centro y Noroeste (five pieces) and Litoral y Región Pampeana (seven pieces). 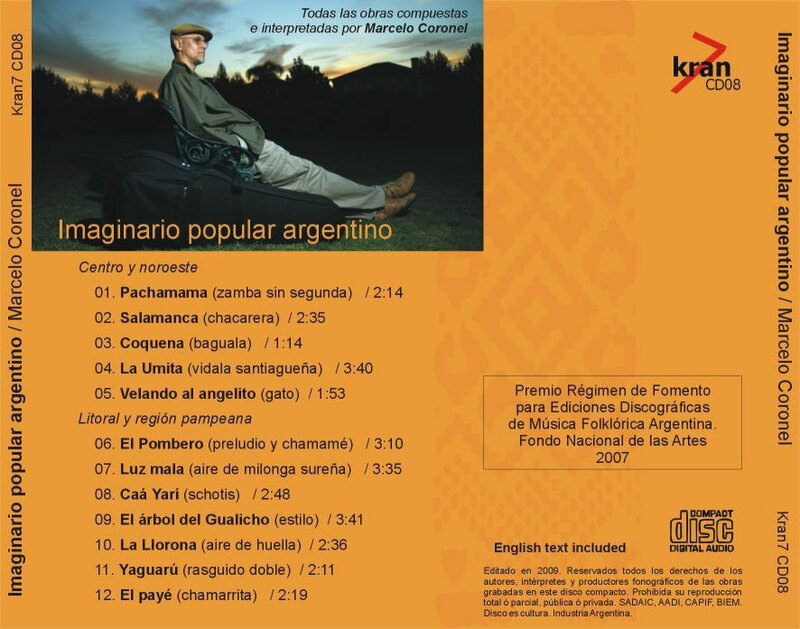 The idea to compose this series stemmed from an atypical experience in my musical life: my participation in a radio program dedicated to the folklore of Latin America. I was to search for material relevant to the myths, beliefs, superstitions and legends that populate the collective imagination of our region, a task that revealed to me the diversity and richness of nuances of our folklore. Unfortunately, that collection of cultural manifestations remains largely unknown, especially in the cities. Having finished the radio project, I felt it worth the trouble to continue its diffusion and decided to do it writing music that would have links with those subjects of the non-musical folklore. 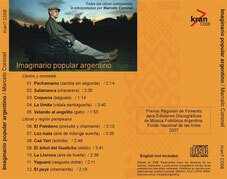 The titles of the pieces recorded here refer to some of the most common beliefs of Argentine people. I have included brief explanatory texts, though they are no more than a summary of some of the readings. Comment: Twelve pieces for solo guitar. Edition awarded and sponsored by the National Fund for the Arts. 1. Pachamama / The Pachamama is the principal deity of the native people of Bolivia, Peru and the Argentinean northwest. She is identified with the earth, and her temple is all of nature. To pay homage to her, locals and travelers erect small mounds of stones, called apachetas, alongside roads, especially at summits. She intervenes in all acts of life, and her protection is called on for a good harvest, for the proliferation of the herd, to relieve cold spells and plagues, to prevent altitude sickness on journeys, etc. 2. Salamanca / The Salamanca is the place devoted to the cult of the devil, generally a pit or distant cave in the forest. Those who go there do so to request diverse powers or abilities, like the skill to play musical instruments or to sing, to be irresistible in love, or to learn witchcraft. But as a price for obtaining such gifts, one must hand their soul over to the devil. 3. Coquena / In the Argentine provinces of Salta and Jujuy there exists a magical creature named Coquena who is considered to be a divine protector of animals. He is described as a dwarf with indigenous features, dressed as a Sheppard. Coquena watches over the herds that graze in the hills, striving to go unseen by men. He has the habit of chewing coca continually and wandering about the hills whistling and playing his flute made of condor bones. It is said that he can be generous with good shepherds, but he punishes without pity all those who abuse the vicuñas and guanacos or travelers who place excessive burdens on their llamas. 4. La Umita (The Umita) / In the Argentine province of Santiago del Estero, Umita is the name they give to a legendary being that they describe as a human head with long tangled hair that roves alone at night, rolling on the ground or flying almost at ground level. The Umita is probably the soul of a person condemned to pay for his wrongdoings. It usually appears in the ruins of abandoned ranches or old roads, crying and imploring the traveler to help it escape from its sorrowful situation, but in general it only manages to terrorize the traveler and causes him to flee. The Umita disappears at dawn. 5. Velando al angelito (Little Angel Wake) / An ancient belief says that children who die before the age of seven are pure beings since they have not had time to become tainted by human misery, and for that they are considered to be angels who go directly to heaven. So, when a child passes away, the wake is a meeting with music, dance, food and alcoholic beverages, bringing together relatives and neighbors. It lasts the whole night. At dawn the burial takes place, to which people must attend without shedding tears, which would wet the wings of the little angel, impeding his ascent to heaven. 6. El Pombero (The Pombero) / In Paraguay, southern Brazil and northeastern Argentina there is a magical creature, guardian of the wood and the birds, who lives in abandoned brick ovens and ruins of field houses. He is described as a tall and skinny man totally covered with hair. He wears a great straw hat and helps himself to walk with a cane that he carries. He has the custom to whistle, imitating the song of the birds. If he finds children hunting birds at nap time, he carries them off. He falls in love easily and is used to having the women that he wishes, especially if he finds them sleeping outside in the summer, leaving them pregnant. It is possible to gain his friendship by going at night to the woods to look for him and imitating his whistle. If he answers and allows the man to return home, the Pombero has accepted him as a friend, which obligates the man to leave tobacco and food at night near the ranch. 7. Luz mala (Bad Light) / In the countryside, a light is usually seen at night that moves at ground level, waking up inhabitants and occasional travelers with a superstitious fear. It is believed that it is the soul of a deceased person who has not been given Christian burial and appears in this way to ask a favor. Many hasten to fulfill what they understand is being asked of them. Other times it is believed that the light indicates the presence of a buried treasure. In the case of really finding it, the lucky one must pay several masses for the soul of the deceased that has “passed the information” to him. In case of meeting the bad light, it is recommended to pray and to put the sheath of the knife between the teeth. 8. Caá Yarí / The Caá Yarí is a beautiful woman, protector of workers of the yerba plantations that decide to make with her a fidelity agreement. The interested man must go to the woods, where the woman tests his courage by sending vermin and wild beats that will harass him. If he remains calm, they sign the pact: each time that he goes to cut yerba leaves he will fall asleep while she does the job, finding the enormous bag full when he wakes up. 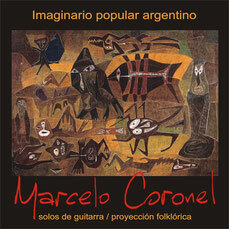 But if he has an affair with another woman, the Caá Yarí -who doesn’t forgive- will kill him. When a sleeping man is found in yerba plantations, it is known that he has made a pact with her. And when someone dies young, it is -almost sure- because he has betrayed her. 9. El árbol del Gualicho (The Tree of the Gualicho) / Aborigines that lived in the south of the Pampas gave the name Gualicho to an evil spirit, the causer of every misfortunes. They believed that it had been born in the Tandil hills, from where it propagated its influence. If they had to go through its domains, they did it in respectful silence. Also, to calm it down and not to be a victim of its wickedness, they must leave a remnant of their clothes or a bag full of little stones in a lonely tree standing beside the way in the middle of the infinite plain. Twisted, dry and damned, the tree offered an odd and worrying spectacle, with its branches full of offerings lashed by the Pampero (strong wind from the southwest of Patagonia). 10. La Llorona (The Weeping Woman) / In the roads in the south of the province of Buenos Aires a woman dressed in white clothes occasionally appears. She does not have a face or feet, and therefore goes flying, very near to the ground. Since she complains and moans constantly, she is known as “la Llorona.” If she comes close to a house it is almost sure that its inhabitants will suffer misfortunes and diseases. And if someone takes pity on her and approaches to help, she steals everything that the person has on them. 11. Yaguarú / Some navigators that went up the Paraná River in the XVII and XVIII centuries, left in their chronicles references to an aquatic beast that the native people called “Yaguarú”. It approximately had the size of a donkey, a flat back of greenish color, and swims on the surface, agitating the water. It hollowed the gullies off with its long tusks to cause collapses, making the people or animals that would be there by chance to fall to the water. When this happened, it tore them apart to eat their lungs, scorning the rest. 12. El payé (The Payé) / Payé is an amulet for good luck, to cure diseases, etc. and can be made by diverse materials. One of the most esteemed is the feather of the “Caburé”, a small bird of prey that has the power of attracting nearby birds, to choose among them for its prey. That ability of attraction is transmitted to the owner of the feather, who -instead of birds- hypnotizes women. That is the reason for which the word “Caburé” has been incorporated into the vocabulary of the Argentine northeast to designate the irresistible man.